Firstly just want to say over the years I read over all the various topics on the forum and appreciate your knowledge, wisdom and kindess in helping out the lesser geeks. My question is as per the subject title, but just background. Moving in to a rental property. Orcon Fibre 100 plan (used your referral link, so thanks for that!). Fibre already installed and ready. Recieved the Orcon supplied Router. Having never been on Fibre before, it will vastly increase the speeds and reliabilty I have been use to on ADSL. I have gamed comfortably for the years which has the occasional drops and spikes, but completely blaps when my wife uploads a picture to instagram and my game times out....I look forward to this never happening again during the last ranked match round on Rainbow Six Siege or running a solo abyssal in Eve Online. Ever. The ONT is located in the lounge, away from the sun/office room where I will setup my PC. It is roughly 8 metres away but crosses the front door's path. I thought about running an ethernet cable on the surface of the wall via the ceiling as that's the primary option, but last resort as is a rental property. I cannot run the cable on the skirting boards etc. because I have a young daughter who will rip it off and eat it. My PC does not have a wifi PCI-E adapter (because I never dreamed of going wireless over cable for gaming!) and I don't think it is reliable enough as a gamer if I invested in one to connect wirelessly to the router provided. I have used Powerlines before, without concerns re speed or connectivity. Reading over some topics, most do not appear on the forums to recommend them and I totally understand why because quite a few people do have trouble and have lesser speeds. As for me this appears to be the wiser option in this circumstance. If I eventually upgraded to the Gigantic Fibre 900mbps/450, would the V600 hinder this in reality? Altrenatively, do you have any other recommendations in this situation? Possible to run an Ethernet cable out the lounge window, around the outside of the house, and inside through the office window? You might also want to upgrade to the Gigantic fibre plan. Just to get the faster upload speed. Before you do this I'd probably look a wireless. It's pretty good these days, especially if you use an un-congested 5GHz range. In my quite old house with semi modern wiring about 5 years ago I found powerline very slow, about 5Mbps. A newer house with better wiring should work better. I ended up getting ethernet cable in under the house. You do realise that these powerline carrier things are just wireless tech slightly modified, so all your concerns of latency and jitter associated with WiFi are the same. With that kind of range, I'd recommend a good AC1900 wireless card over any powerline technology. I get a solid 55-60MB/s (480Mbps) to my desktop, which I don't think any powerline kit will be able to do. You will not be able to use the full downstream capacity of gigabit fibre with anything short of Cat5e, but the upstream speed advantages may still make it worth it for you. my father-in-law uses this. in his setup, it tops out at 45 Mbps at his house. didn't check latency. off the top of my head they only have fast ethernet ports, so it's not getting any close to 600 Mbps. RCDs seem to play havoc with powerline kits too - seem to reduce range and speed dramatically. If you are in Tauranga you can borrow my EoP to test it out. I have remained with the Orcon Fibre 100 Plan. Using a direct Ethernet cable at first was impressive. I found an older Powerline DHP-P308AV to test this out. I believe the max is 200mbps using this. There appears to be a slight loss I would agree. That said, I recognise there is some loss with the use of this older power-line but it works. Based on what you guys have said, I would be extremely foolish to get the Gigaplan and use this powerline. 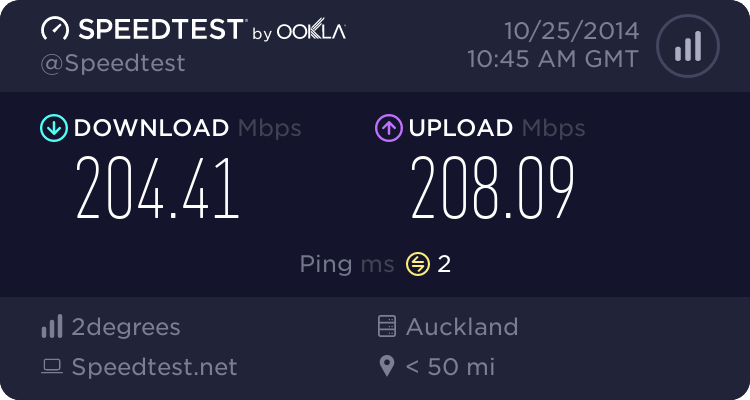 But over all, coming from ADSL... this is an unbelievable comparison and I am very happy. The wife uploaded photos and videos galore while I pew-pew'd some newbies.... and absolutely no fault. So so cool. If I have extra money to throw around I will take your WiFi recommendation, get a PCI-E and see if this new technology nowadays can handle gaming.